Oct. 22 (NBD) -- The VR industry is expected to see major developments in the coming three to five years, especially in industrial application, said researchers at the 2018 World Conference on VR Industry held at eastern China's Nanchang, Jiangxi Province from October 19 to 21. Although VR has been hotly pursued by investors since 2016, it hasn't seen explosive growth as expected. 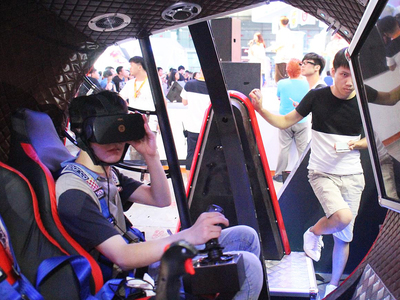 The VR industry is still in its infancy, noted Wu Shengwu, Deputy Director-General of Electronic Information Department of the Ministry of Industry and Information Technology. Intel Sports Group's CTO Sankar Jayaram conducted an on-site survey at the conference, finding that only about 30-40 out of the 500 attendees have VR/AR glasses and a mere 7 often use those devices. At present, the industry is facing three major challenges: technological deficiencies, lack of VR contents, and abundance of low-end and similar products. Currently, most front-line participants are developing VR hardware. Despite the involvement of industry giants like HTC, Facebook and Microsoft, no remarkable achievement has been made in technological development and user experience of VR headsets. Motion sickness, such as vertigo, still remains unsolved, which easily dissuade consumers from using VR products. This could be addressed with the help of the 5G technology, which features low latency and edge computing, said Zhu Fang, chief video architect of telecommunication giant ZTE. Meanwhile, Wen-Chi Chen, Director of HTC, told NBD that they are endeavoring to develop VR glasses that are as light as those people usually wear. In the future, VR devices will become more closely connected with smartphones. At that time, smartphones will be used only for back-end computing and contents will be mirrored to VR glasses. With regard to the enterprise-level applications of VR, Lu Shan, head of the China Center for Information Industry Development, said businesses might be more tolerant of existing technology defects under specific scenarios, so VR developers should continue their research and take on more trial projects so as to increase VR adoption among businesses. In addition to technological difficulties, the lack of contents is a significant issue for VR companies to surmount. Ding Wenhua, academician of the Chinese Academy of Engineering, stated that VR filming requires at least 4-6 cameras horizontally and 2-4 cameras vertically, and footages have to be stitched before they can be finally displayed on VR devices. This adds difficulties to the production of VR contents. Even so, Zhao Qinping, academician of the Chinese Academy of Engineering, believes that mobile terminal- and Internet-based AR/VR have great potential, as emerging technology platforms will be critical to underpin the upgrading of industries like medical, equipment making, military and aerospace. According to statistics released by the Industry of Virtual Reality Alliance, China's VR industry grossed 16 billion yuan (2.3 billion U.S. dollars) in 2017, an increase of 164 percent from the previous year. By 2020, the industry is expected to hit 90 billion yuan (13.0 billion U.S. dollars).